Colourful Holi Decoration Ideas for Your Home! Holi is the festival of colors in India, welcoming the spring season (summer) the people & streets are awash with the Colors and Joyfulness! Holi decoration, therefore should also be colorful! Now it’s a time to bring the charm of the colors to your home too! Also Read: 16 Tips to Decorate & Furnish Your Home on Auspicious Occasions! To decorate your home for festivals such as Holi & Diwali is a very exciting task! All you need to do is to pick up the right decor items keeping the particular festival along with its spiritual importance in your mind! The use of bright colors in holi decoration symbolise the all positive vibes that can add to your home! Let’s decorate your home look unique in this Holi with some changes in furnishings, paintings & some exciting & creative decorative ideas! Gharpedia has come up with some simple & classy Holi decoration ideas that will endear your family & guests during the Holi gatherings! The Holi festival has a cultural significance among various Hindu traditions of the Indian subcontinent. Generally, Holi celebrations start on the night before Holi with a Holika bonfire where people gather, do religious rituals in front of the bonfire, & pray that their internal evil should be destroyed as the bonfire starts. The next morning is celebrated as a Rangwali Holi free for all carnival of colors where the participants play, chase & color each other with dry colored powder & colored water, with some carrying water guns & water-filled colored balloons for their water fight. The play and fight with colors occurs in the open streets, open parks, home patios, courtyards, outside temples, buildings, etc. You can buy some bright, readymade cotton curtains for your doors & windows which open towards patios & gardens. You can choose the curtain designs from the variety of bright colors like green, yellow, pink, green, red, etc. whichever you like the most! This will bring the great change in your home interiors. Rangoli or floor patterns with different colors are also associated with the Holi festival. You can also decorate your home patio, door entrance & other outer places with different rangoli designs. 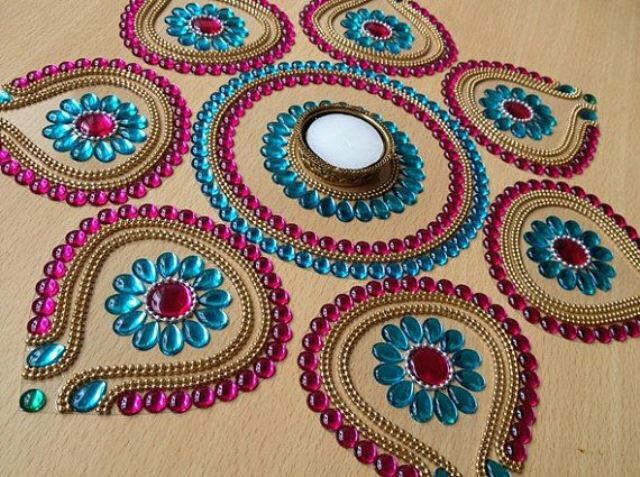 As we know the Holi is the festival of colors, creating a rangoli is one of the best holi decoration idea to try! If you cannot make it on your own, you will find the ready-made floor pattern on paper in the market that can be glued to the floor which can be placed at your entrance door. 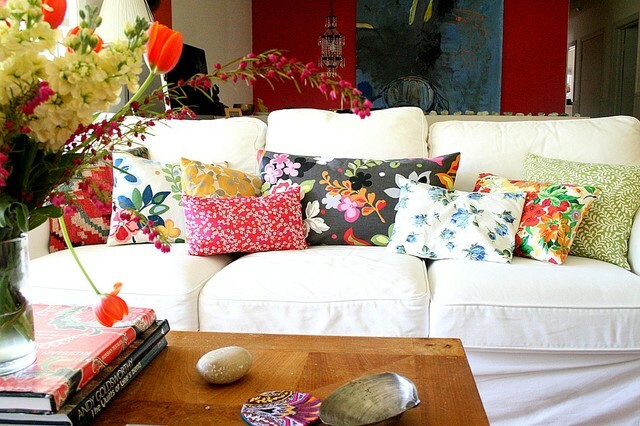 Use the colourful cushions in your living, dining & bedroom matching with your colourful curtains. You can also update your bedroom bed-sheets with the variety of bright colors. Prefer using some colourful cushion covers which have mirror work. It will add the festive charm to your home interior! Also Read: 25 Creative Tips for Your Rooms Makeover! In home interiors, do not neglect the walls! You can add some quirky, & hand painted wall hangings that have the more ethnic appearance. These hand painted items add a quirky appeal to your home interiors & highlight the fun aspect of Holi! To decorate your home walls with some bright & colourful paintings is one of the simplest ways to bring the spark of the festive home interior! 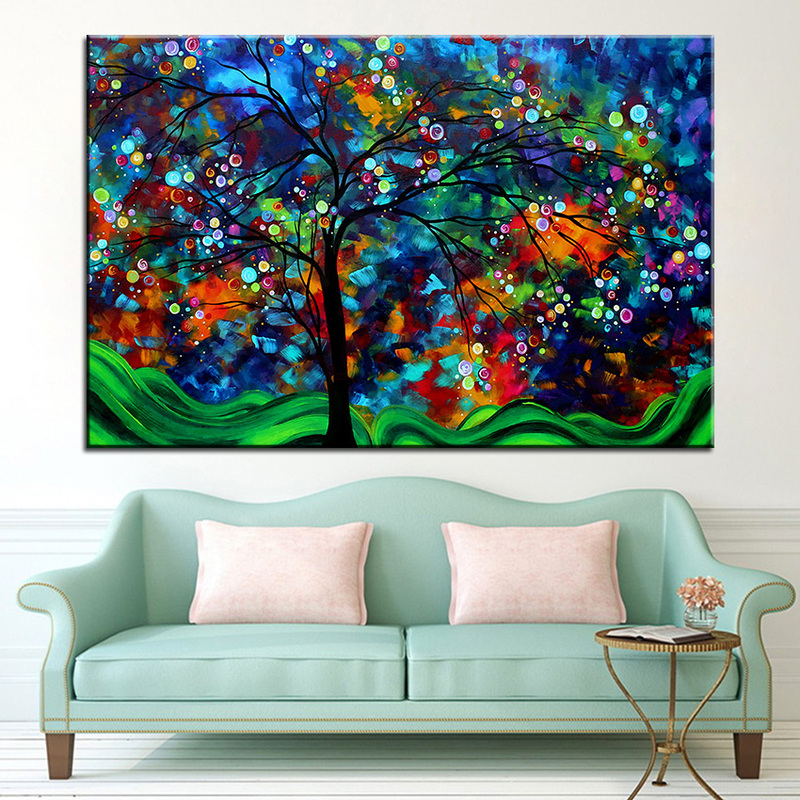 If you can buy the wall painting, then purchase the one which is very bold coloured art for one of your wall that is close to an entrance, or you can also hang this in your living room. It is a great idea for holi decoration of your home! You can also decorate your home wall the framed pictures in crafted patterns or mirror work and hang them along with the multicolor patchwork & motifs to beautify your wall! Remembering elders, grandparents will inspire young & of course, it is an occasion to seek their blessings. You can arrange the pictures of your family in frames around your home! The simplest way to add some colour to this Holi is to decorate your home with the flower which enlivens the ambience with cheerfulness! Colourful garlands can easily hang on at various places, such as balconies, outside doors, staircase railings, etc. Flower petals can also be used to make the beautiful rangoli designs at your patio, & of course, add some beautiful bouquets to your home interiors! Holi is a daytime festival, but multi-hued lights & lanterns can add a bright radiance to your home outdoors & indoors. In the evenings you can brighten up your home with these beautiful lights and welcome the lively colors to your home. You can buy a series of lights, couple of ornamental, netted, pendant lanterns that give off a beautiful, incandescent glow. These can be used again for the next other festivals and preferred as a good investment! Painted pots are very attractive & fairly easy to get. You can have a clustered arrangement on any side table or room corner. Painted pots can be bought ready-made or can be a great DIY (Do It Yourself) project, starting with simple clay pots from your local vendor & painting them. You can make the pots as colourful as you like for this holi decoration! You can include some bright home decor items into your home interior. For example, consider the funky painted candle stands that can emphasise the Holi atmosphere within your home! For Holi decoration, you should pick the colourful rug that complements your home decor, & accessories with accent pieces should matching with the rugs. Be sure to choose the cotton rugs so that your floor stays cool through the warmer months! 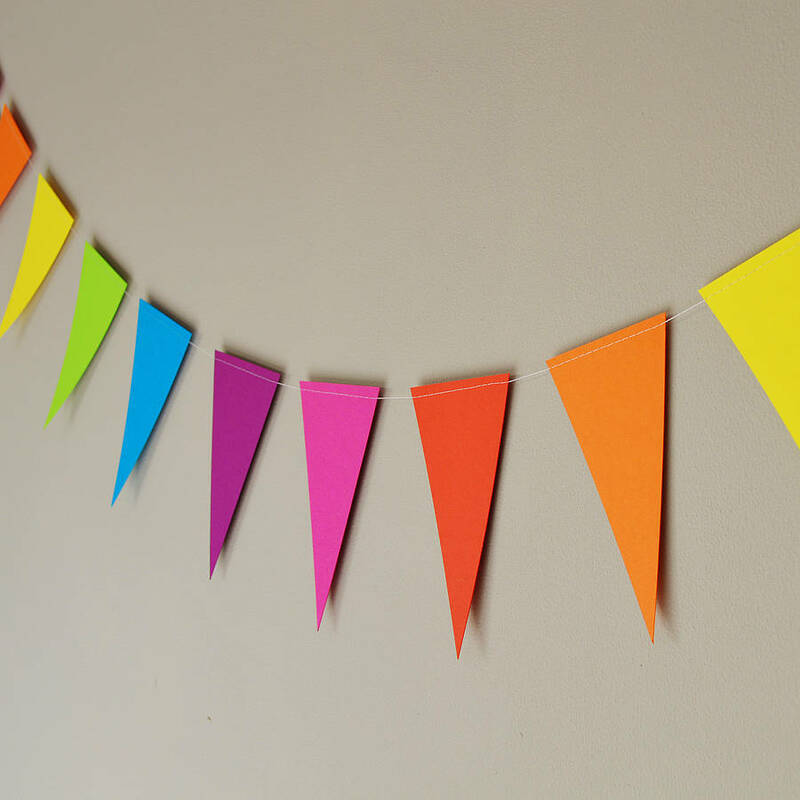 You can also decorate the outdoor space of your house like lawns, balcony, courtyard, etc., with colourful paper buntings. Hope this article helps you get enough inspiring holi decoration ideas & lets you gear up to celebrate the festival of colors with calmness! Indian Weddings: 16 Tips for Your Home Decoration! Home Decoration Ideas for this Navratri Festival! Previous PostPrevious Plan Analysis of 3 BHK – Duplex – 234 sq.mt. Next PostNext Best Location for AC Unit in Your Room!